Saving Lives Drug and Alcohol Coalition Underage Drinking Retail Signage Prevention Campaign was kicked off at a press conference on November 13, 2012 at the West Valley Los Angeles Police Department.Members of the press from local and national television, radio and print media were in attendance to report and document this tremendously important campaign launch. 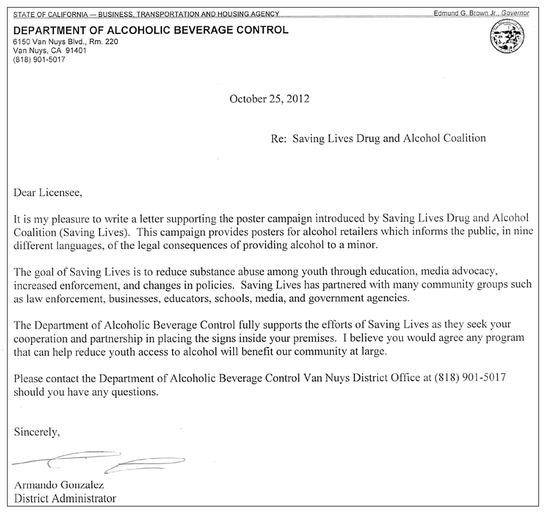 The Underage Drinking Retail Signage Prevention signage was created by Saving Lives, with the approval of the Department of Alcohol Beverage Control, to address the buying, selling or providing of alcohol to youth under the age of 21. The goal is to have this signage in all establishments where alcohol is sold throughout the state of California. Our next step, as a Coalition, is to making this signage move from voluntary to mandatory, just as tobacco signage is mandatory in all tobacco selling establishments. Up to this present time, there has been no mandatory signage about selling alcohol to minors. 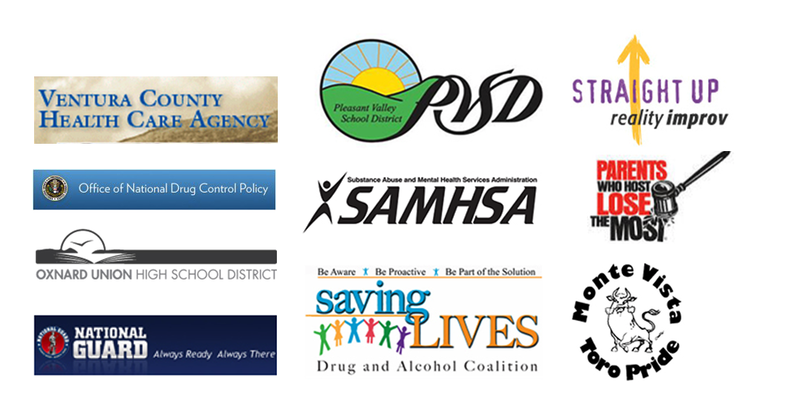 Underage drinking is the #1 substance of choice among the youth and addressing this issue is urgent necessary. We need to begin forging this path to mandatory signage immediately. You have questions? Dont hesitate to contact us, Our supportteam here to help you by 24*7. Possibly you have had your own struggles with chemical addiction or know of someone whose child had a nearly fatal overdose of prescription medication. Your experience is important and could make the difference to another person. Reach out to Yaakov at communitydirector@savinglivescamarillo.net or call (805) 738-8942 to find out how your message could be shared with others. As a small organization, volunteers are vital to our operation. Whether it is performing office tasks or helping us in the community, there are always areas in which extra hands would be appreciated! We also need people in our smaller committees: the Business Task Force, the Youth Task Force, and the Parent Task Force. Please contact Yaakov Cahnman at (805) 738-8942 or communitydirector@savinglivescamarillo.net if you are interested in becoming a volunteer for Saving Lives Camarillo. Copyright © 2019 Saving Lives Camarillo. Theme by Puro.